Aromas of toffee, oak, and dark fruit announce the flavors of this rich beer. A strong caramel bacon leads the way as dessert-like nips of chocolate, rum, and dates take flight. 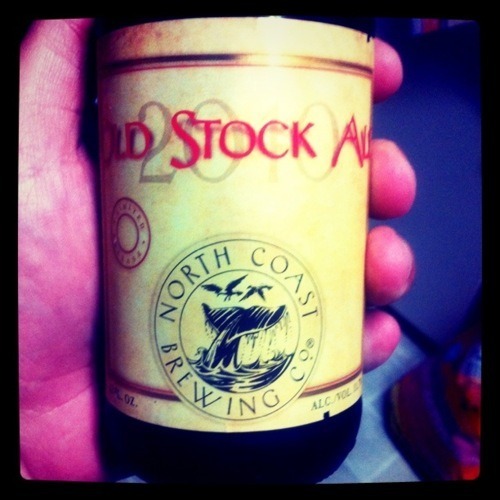 A boozy, bourbon-like presence makes Old Stock Ale a pleasant nightcap. For a beer with this big of an ABV, you would think it would be a tad bit thicker than it is. But it pours out nice, with light bubbles… almost like a good barleywine would pour. Heck, this is so big in terms of ABV, it might as well just be called a wine! You get some subtle chocolate notes on the nose. Let’s take a sip. This been has been referred to as a dessert beer, and I can see that. It’s not as thick as most dessert beers, but it doesn’t need to be. This beer is BIG and very very VERY good! Did I just find a new favorite beer? I don’t really know much about the beer we are getting ready to try today, other than what the bottle looks like and what it looks like in the glass. It actually looks kind of good, as it reminds me of a barleywine and I am learning that I seem to really like those. In the glass, it is think and kind of a reddish-brown color. More brown than red, and definitely a medium brown, not a dark one. It also looks very carbonated – there are still bubbles floating to the top. Not much head either. It smells… musty. It’s got that wet smell to it and smells a little bit spicy. Other than that, not really too much aroma. Let’s find out what it tastes like. Wow… so good. It actually kind of tastes like a barleywine to me. VERY flavorful. It doesn’t taste as carbonated as it looks. It tastes spicy, fruity, and thick. And it packs a punch with an aftertaste that just sits on your tongue for a really long time. I really like this beer. At 11.7% ABV, it’s the kind that you can sit and sip for a while and all of a sudden realize you’ve had a lot of alcohol. But it’s good stuff, definitely something you want to savor. And something I would for sure buy again.